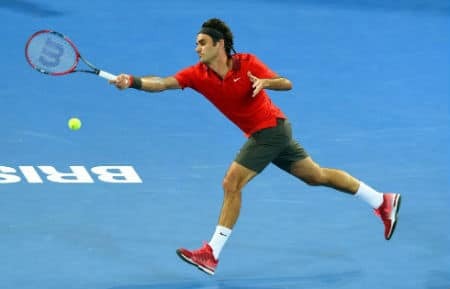 Hey all, Roger's 2015 season is up and running and it started with a hard fought victory against World Number 153 John Millman at the Brisbane International. It was Fed's first competitive outing since the Davis Cup final in November and he was required to dig deep, coming from a set and a break down to win through 4-6 6-4 6-3 in two hours and two minutes. Millman came into the match a huge underdog but soon found his feet, striking the ball firmly and consistently from the back of the court; giving Fed zero time to really out manoeuvre with his forehand or dictate the points. That saw him drop he first set and fall 1-3 behind in the 2nd but he dug in, upped his consistency and got more aggressive to hit back before breaking twice in the decider to book his spot in the Quarter Finals. Millman opened up proceedings and Roger had an immediate chance to stamp his authority on the match with a break point which was missed with a wild forehand. Millman went onto hold and that gave him a nice shot of confidence which he used to his advantage with some quality hitting from the back of the court. The Aussie brought up to break points of his own when leading 3-2 but Roger stamped them out with some clutch serving. The Swiss twice then made deuce on his Millman's serve at 3-3 and 4-4 but he dropped the opening set when after saving 2 set points he missed a drive volley at 30-40, 4-5. Winning the opener gave Millman even more of a boost and in the second he was seemingly all over the court. No real space for Fed to work with and he was the player looking rushed on the baseline which is unusual territory for him. Millman's attacking style worked perfectly for him as he broke to lead 3-1 and get himself in sigh of the finish line; but Roger hit back immediately with some stylish play, notably the backhand winner on the second deuce to break back. Failing to consolidate took the wings out of Millman's sails somewhat and Roger then came up with a top drawer volley at full stretch to break again to lead 5-3. Millman did have a break point back chance at 4-5 but Roger closed it out to take the match into a decider. Getting back on level terms put the match firmly in Roger's favour and he began to play with more freedom in the third after; moving his level up a notch and getting more time to setup the points how he'd like them. Millman didn't go away though, again coming up with some great hitting and consistency from the back of the court until 3-3. Here Fed finally got the all important break; perhaps buoyed by an incredible around the net post shot in the previous game. 4-3 soon became 5-3 and with Millman serving to stay in the match he was again broken to 15, drilling a forehand into the high part of the net. Game, set, match, Federer. A clutch mental display here from the GOAT which is a positive sign heading into the new season. We saw Fed show his competitive nature throughout 2014 and it was on show again here in Brisbane. Coming from a set down in a best of 3 is always tough but to recover a break in the 2nd set too is testimony to Fed's resilience and ability to grind out the win. He was arguably the lesser player for most of the match, making 21 unforced errors in the opening set but he won some of the important points by hook or by crook and came through the test. I don't think he played badly either, it was just a combination of Millman really taking it to him and forcing the issue from the back of the court combined with some natural rustiness or feel in the groundstrokes. Remember Fed had break points in the very first game so it could have been a rout had he converted. As it turned out Millman found his feet after the early hold and he was clearly feeling confident playing on this surface in his home state. That was always going to be tough to contend with and Roger did a very good job keeping himself in the match when things did look to be slipping away. Big plus point I reckon and always a confidence booster to win the first match of the season whatever the means or level of performance. 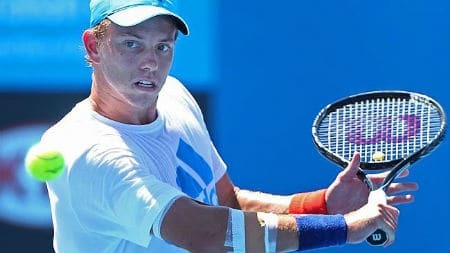 Next up is James Duckworth who took out Gilles Simon in his opening match and then overcame Jarkko Nieminen, saving a match point to book his spot in the Quarter Final. Roger played Duckworth at last years Australian Open, winning comfortably 6-4 6-4 6-2 and I predict a similar affair tomorrow. Millman's success in Brisbane today came from very good movement and crisp hitting from the back of the court and whilst Duckworth can hit a big ball he doesn't possess the foot speed or same consistency from the baseline. Roger will be able to move his opponent around easier and slip into a groove where he isn't being rushed on the baseline. Only one winner if that's the case. Fed in straights: 6-4 6-2. Lacked consistency from the back of the court, poor approach shots but won the big points to get through. Yes you did! Damn it! Yay! Podium! Hoping Jonathan awarding medals for top 3 this season!! We’ll decide at the AGM next week. Welcome to 2015 Jonathan! Good to hv the first post of the yr! Thought Fed was ok for a 1R game. Millman certainly played without fear and was quite like Hewitt with his bustle and consistency. However, like all these guys 100-200 ranked, he ran out of energy in the 3rd set as didn’t pace himself at all, something Fed is very good at. Feds first serve needs to come back plse and yes poor approaches but generally A- for first outing! Unlike Nadull (B-) and Novak whose match up with Dr Ivo was found wanting. Agree re Duckworth. Doesn’t hv the smoothness off the ground of Millman and Simon was clearly hampered by his knee! Fed jn 2 trouble free sets! What is it with these Frenchmen and early season injuries? I hear Tsonga out of AO! Happily Delpo is playing Sydney next week! In the meantime, I am picking Klizan to trouble Grigor, Birdman to win Doha, and Fed to be playing Kei in Sundays final! I’m picking Birdman also for Doha – he played very well against Gasquet who looked totally lost. He’s definitely the strongest left in the field. I’m not doing any other predictions as I rarely get it right, although Kei/Feds final looks a good bet. Yeah, Murray was definitely more aggressive in Mubadala from what I saw. Came to net quite often. Good spot! Volleying is the new cool!! Yeah I think so too, he was high on adrenaline in first two sets. @Susie Yeah Tsonga definitely out, got a cast on his wrist. Same injury from Davis Cup? Surprised he managed to play IPTL 😆 I wonder what got him out of bed for that one?? Looked like routine for Dimitrov vs Klizan? Didn’t watch. Nishi looking solid. P s plse bring back shot of the match!! Then maybe at the end of the season we can judge a winner!! I can’t unfortunately, it will get deleted upon upload. Could you at least link to the ATP’s shot of the day? A nice fast and very accurate report. I didn’t think Roger was playing well and couldn’t watch it to the end. However, I checked the final score before going to sleep and was happy to see that he must have improved in the final set. I have recorded it and can watch it now that I know he won. Your stats don’t show info re winners, net shots and unforced errors. How did he go in these departments? Nearly paid for my crowing over Nadal’s loss! 🙁 Feds got the win and that’s what counts in the end. He did look pretty pissed when he lost that first set! I thought Millman played well; good serving, hitting shots deep and keeping Feds pinned to the back of the court. Hardly any forays to the net. I do hope it goes the way you suggest against Duckworth, but you’re usually spot on so I’m happy with that. He’ll be a little more comfortable with the court tomorrow hopefully. Good to see him back on court even if he wasn’t at his best. Finally a proper screen to watch on!! What a shame he didn’t give you more time to watch, Susie! I think that first set must be some sort of record, by quite a way, isn’t it? All I know is, I thought: 9 am, give em 10 minutes to get out there and warm up; 9:55 let’s have a look and see how he’s doing; whaddya mean he’s won already?! Not even close 🙁 I give up. Question- Who was the first “First” ever? I wonder who started this all. Good question! The thing is, I wrote ‘First!’ on Jonathan’s very first blog post back in 2011, but I only did it last year in an unsuccessful attempt to cheat points for the leaderboard! It definitely started sometime in 2013. I remember a time where Simon claimed first, (think it was during the Hamburg tournament) but Sid disqualified him for reasons unbeknown and suddenly the comments section turned into a legal court conundrum, when culminated with me claiming the trophy! Haha! Those were the good times! Happy Birthday!! Sorry I’m late. Hope you had a wonderful day. First comment thing – I just remembered how I did it, started it in 2014, but I went back through every old post and added them to the leaderboard so anyone who commented previously first before the leaderboard officially began got included. I think it was Brandon who first suggested it? I didn’t see any of the match, just a few highlights from the atp site. Could anybody tell how fast the court was playing? I remember last year, it was playing extremely fast, so if that is again the case this year, perhaps it could have been challenging from Roger to get a good rhythm out there in his first match. 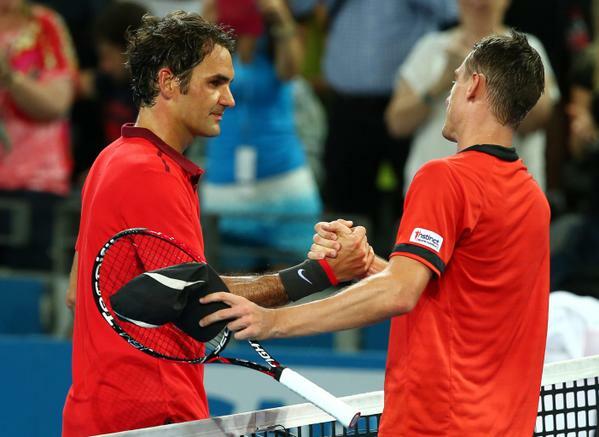 Important 1st win for 2015 season, happy that Roger dug deep and remain focus. Kudos to Millman as well playing best match of his career perhaps. Allez Roger. Yeah Millman was impressive, interesting to see if he can play a full season and where he will be ranked if he does. I see Roger has another short recovery time today, and he was playing until late last night. Hoping he’ll have an easier time against Duckworth, since he’s played him already, and that it won’t be another inspired Aussie! I was worrying yesterday, what with the change in Roger’s schedule, and watching on livescores, whether the scoreline wasn’t another case of his back playing up, but everyone seems to think that Millman played the match of his life (where have I heard that one before?! ), so kudos to him. Yeah no issues with back at all, he fired down some very big serves during the match over 190km/h. Very solid match for the first of many hopefully this year. Credit to Millman, I remember he had Murray on the ropes in Brisbane a few years back and playing at home gave him a clear advantage. I thought the combination of rust and some loss of confidence over the break allowed Fed to be resistant but super glad to see Fed’s mental toughness from last year come through. Millman’s BH was letting him dictate in quite a few rallies and it wasn’t really until the last few games of the third in that his first serve fell, enabling Fed to step it up and push him deeper on the baseline. That angled shot he hit at 2-2 in the third was pure genius, more of that please! Not loving the schedule for Roger now if he is to win the title, not sure why he couldn’t play his match on Wednesday (not to mention he is playing a match in Sydney on Monday). Hope for an efficient match against Duckworth. Also, in the post-match interview, Fed said he’s taking a “big break” after the Aus Open, I don’t think Roger has released his schedule yet for the year so I’m assuming this means he’s gonna skip Davis Cup and possibly Dubai. Yeah I’d forgotten about that match vs. Murray. Millman is pretty solid, if he can stay injury free he is surely top 50 at least. I didn’t see the interview but Conal mentioned it in live chat, would be surprised with no Dubai but could be a sensible decision. Guys, straight after Brisbane, before heading down to Melbourne, Roger is making a quick stop in Sydney on the 12th to play an exhibition match with Hewitt, debuting a new format called FAST4 tennis. The format is really similar to the IPTL league, except its first to four games instead of six. Short deuces and lets are played. Ah nice 🙂 should be an interesting event, the concept sounds interesting. But again just a gimmicky thing that probably won’t go anywhere other than being a money spinner. Well, well, well Conal. I’m guessing you got tennis tickets for your birthday! Lucky you to see Roger in Sydney. I’m just watching Tomic/Nishikori. Tomic picking it up but not surprised if Nishikori wins a lot this year. Chang has done wonders for his game. Missed the Fed match. I watched his press conference. He said fatigue was an issue for him. He also said he was taking a break after AO. Nice to see him pull this one off though. Agree with you Susie on all fronts. Yes, Katyani, more serve and volley from players. Interesting. Yeah Nishikori is very solid. This court definitely will suit his game of taking it early. Will be a handful for anyone. I couldn’t watch live, so appreciate the match report and highlights, thanks Jonathan. A good start of the year. Sounds like he gave fans a few face-palming moments but showed solid and strong mental side, pleased to hear. Look forward to the next round, allez! Belated happy birthday and wow congrats on getting Sydney tickets Conal! Yup 4/13 on break points, should have won the first game tbh and then might have been a different match! I missed the Duckworth match. Shayy. Apparently it was a beatdown!!! 39 minutes!? Shortest match ever? 3rd I think. He beat Golovanov at the Kremlin Cup in 37 minutes back in 2002. Zverev in Halle 2013 was 39:26 minutes and this one 40.34. What in the world was Duckworth doing on his return!!!? I mean, I just saw some highlights and it reminded me of when I would play Virtua Tennis on the Easiest difficulty level.